The Kylwalda allows you to use cheap PC high density floppy drives on your Amiga. The device can be connected to either the Amiga's native floppy drive controller, or both the Amigas native controller and one of the various Catweasel controllers. The Kylwalda supports one floppy drive. 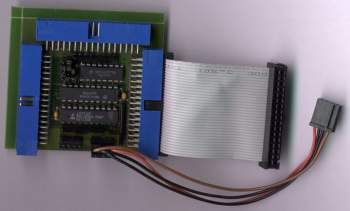 If it is only connected to the Amigas native controller, the disk drive can be used as a normal, low-density Amiga disk drive and being able to boot from it. If it is connected to both the Amigas native controller and a Catweasel you get the best of both worlds. You can boot from the drive and use it as a normal Amiga low-density drive. The second AmigaOS has is loaded, (Mounting the drive is required. The Installer script takes care of this) the Catweasel assumes control of the drive, and you may use high-density disks in the drive. To connect a Kylwalda between a Catweasel and a PC HD drive (Without connecting the Kylwalda to the Amigas native controller) would not make any sense, since the Catweasel can take care of the drive on its own.